1587 Restaurant’s head bartender and resident drink maven, Matt Brent, loves to talk shop. As he sets up for the night behind 1587’s famous coppertop bar, he chats enthusiastically about all the details that go on behind the scenes at one of the Outer Banks’ most acclaimed restaurants. 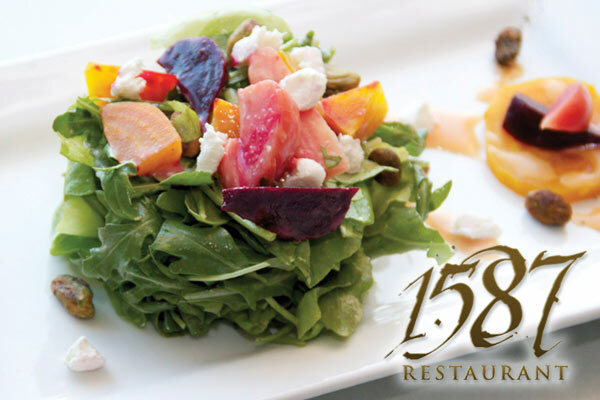 For Donnie Just (manager and soon to be owner) 1587 Restaurant in Manteo is more than just a business – it, along with the adjoining The Tranquil House Inn, is part of the family. No matter how you sightsee in Manteo’s downtown waterfront – walking, driving or boating – you’re hard-pressed to not slow your pace and marvel at the Tranquil House Inn. You'll find world-class chefs who blend the freshest of ingredients, including herbs grown from the Inn's own gardens, today's Atlantic seafood, meats and fowl plus vegetables from the Outer Banks' finest growers. © 1587 Restaurant 2019. All rights reserved.